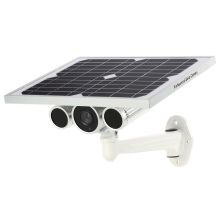 The HD 1080P Solar Power WIFI 4G IP Camera features P2P, H.264, Onvif, IR-CUT double filter, night visibility up to 80m. It supports 3G/4G SIM card, so no need worry about lack of power and Internet. It also has about 2 days backup battery storage, monitoring without charging, it&apos;s energy saving and convenient to use. You can use Android/iOS mobile devices remote view anywhere anytime. The alert notification function, motion detection function and waterproof function make it widely used in outdoor places. *HD 1080P Solar Power WIFI 4G IP Camera. 2.0 Megapixels, 1080P high definition video recording. *Using 1/2.8&apos;&apos; Starlight level CMOS Sensor, as long as a little bit of light, such as moonlight, lamp light, it can get much better night vision than infrared lamps. *Biult-in RJ-45 interface support P2P, plug & play, view on PC & Smart phone, support Firefox, Safari, Chrome browser. *Built-in 2*12AH Lithium batteries for storaging power by power adapter or sunlight, camera can work about 2 days without sunshine or charging. *Standby time is 40 hours when the battery is with full charge. The full battery can last 23 hours when it&apos;s rainy and cloudy days. The battery can work continuously when its 33℃ above. *With IR-CUT double filter, auto switch between day/night, restoring clear image and true color both day and night, night visibility up to 80m. *Built-in 16G TF Card, support 1080P video recording 3 days recording. Support Max. 128G TF card.